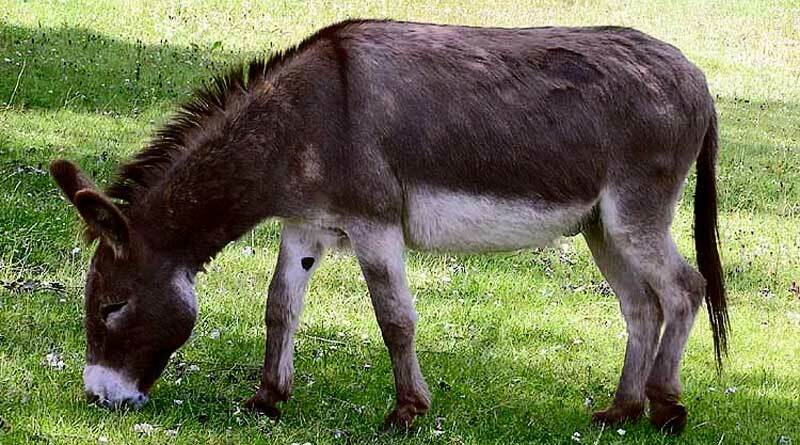 A new genome for the donkey has been completed. Photo: Adrian Pingstone, public domain, via Wikimedia Commons. The genetic make-up of donkeys has been explored in unprecedented detail, allowing for much better comparisons between the horse and donkey genome. The just-announced completion of a new, higher quality genome assembly of the donkey will better equip scientists to understand the genetic changes that separate the donkey from the horse, as well as other related species. Blood from a donkey jack named Willy, who was born at the Copenhagen Zoo in 1997, was used for the genetic analysis. Donkeys are considered a species of major ecological, evolutionary, and economic interest. The domestication of donkeys and horses – two members of the genus Equus, the only living genus of the once diverse horse family Equidae – have been important for humans, especially as means for transportation over long distances. Extensive studies of the horse genome have provided important insights into the process of horse domestication, but the same cannot be said for the donkey genome. Researcher Gabriel Renaud and his colleagues achieved scaffolds – or spans of genetic information – four times larger than the best previously published donkey assembly, according to the authors, who have reported their findings today in the journal Science Advances. The previous donkey assembly had 13 scaffolds larger than 10 megabytes. The assembly generated in this work has 75 scaffolds larger than 10 megabytes. These large scaffolds will allowed for comparisons between the horse and donkey genomes to better understand chromosomal rearrangements, such as inversions or translocations, which tell stories about how the species separated and diverged. When looking for chromosomal rearrangements regarding the sterility of horse-donkey first-generation hybrids, the authors found a rearrangement on the horse chromosome 28, which is a region containing multiple genes involved in fertility disorders in other species. The authors suggest their findings will help inform future research on equine evolution as well as selective breeding and conservation of species in the wild. Donkeys and horses share a common ancestor dating back to about 4 million years ago. The authors said the absence of a better-quality assembly for the donkey has, until now, hampered studies involving the characterization of patterns of genetic variation at the genome-wide scale. Equids, they said, have wide dispersal rates, and their distribution ranges have overlapped in the past. The new donkey genome will help researchers better understand how and when the different species arose. Gabriel Renaud, Bent Petersen, Andaine Seguin-Orlando, Mads Frost Bertelsen, Andrew Waller, Richard Newton, Romain Paillot, Neil Bryant, Mark Vaudin, Pablo Librado and Ludovic Orlando.